She wants to be your best friend. An Aries will want a relationship that’s filled with interesting conversation in which you share strange and fascinating facts about the world. At the same time, she wants someone with whom she can be silly and fun. She wants to be your best friend and your lover, your greatest confidant and your partner. If you want to keep her in your life, make sure she knows that you’re her friend as much as you are her lover. She wants to have an Insta perfect relationship. A Taurus will want to be impressed by you, and she will want to show off your life together. 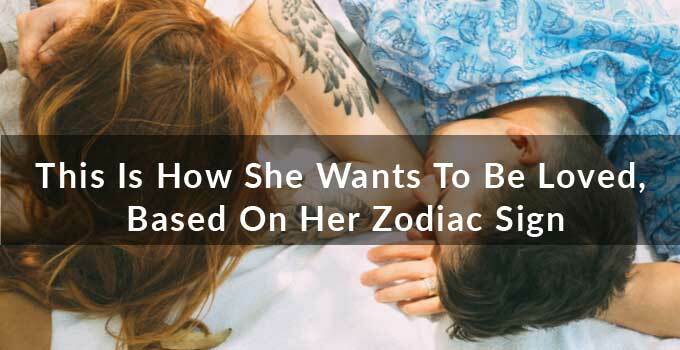 Tauruses are very aesthetically-oriented, as well as independent, driven individuals. If you want to keep a Taurus in your life, she will want to see that you have confidence and that you can hold your own. She will also want to make sure you are someone that she can show off. She wants to connect with you like nobody ever has before. Geminis are the most passionate sign of the zodiac, but they are also the most scatter-brained. This means that if you want to keep a Gemini in your life, you need to connect with her in a way that keeps her attention on you always. To want to be with you, she will need to be constantly interested in you. She wants to trust you. Cancers are highly emotional but very cautious. They have walls around their sensitive hearts, whether they are aware of them or not. A Cancer wants to know that she can trust you, that she can lean on you, that you will be there no matter what. Cancers do not want someone who isn’t going to stick by them through and through. She wants you to be her best friend, her biggest fan, and her most passionate lover. She wants to be committed to you. Leos are known for being prideful and territorial. It only makes sense that to keep a Leo woman happy, you need to show her that you are loyal and completely committed. Men who are faithful and honest are the most attractive to Leos, and if you want to keep her in your life, you need to show her that you are completely her’s, and nobody else’s. She wants to grow with you. Virgos are dreamers in the sense that they are always looking to make things right, or better for those around them. In a partner, a Virgo will need someone she knows she can grow with, someone who challenges her and accepts her at the same time. To keep a Virgo in your life, you will need to show her that you’re as ambitious as she is, and can be supportive when she needs it. She wants to be worshipped by you. Ruled by Venus, Libras are literally the sign of love. They are the most romantic out of the entire Zodiac, and to keep a Libra happy, you will need to be just as passionately committed to her as she is you. To keep her happy, you will need to all but worship the beautiful divinity within her. She wants to be desired by you. Scorpios are notoriously jealous, but even more so, they are known for being secretly intense. Scorpios need to know that you desire them just as much as they do you (even though they are usually very coy and uncomfortable with showing it). A Scorpio woman is red hot fire behind a smiling, casual demeanor, and if you want to keep her in your life, you need to show her that she’s the only thing you really want. She wants to adventure with you. Sags are known for being the wanderlusters of the Zodiac. They don’t want to settle down with a partner, they want to take off – so to say. To keep a Sagittarius happy, you will need to show her that being together doesn’t mean your life is going to be any less adventurous and fun. She wants to settle with you. They’re already planning for the future. Capricorns like to be working toward something, and they also like certainty (they also don’t have time for things that aren’t going anywhere). They take their lives seriously and thrive when they believe you’re working toward developing a lifelong commitment or a family or at least a healthy, thriving partnership. She wants to create with you. They’re selfless and seem to have been caught off-guard by your relationship. An Aquarius is one of the best lovers, they’ll give you everything they’ve got and will want to foster a kind of can’t-live-without-it love. She wants to be a muse to you. They share with you their dreams and are almost immediately devoted. They’ll play their favorite music for you, send you links to things that inspire them, write you letters and want to let you into their weird little worlds. Pisces in love are hopeless, but also very sensitive so they may have a kind of tough demeanor that you first have to get past.